In 2007, the first International Series Game between the Miami Dolphins and New York Giants was played at Wembley. In 2013, the annual fixture increased to two games and the series has since grown with four games due to be played in 2019 at Wembley and Tottenham Hotspurs’ new Stadium in Northumberland Park, to sell-out crowds. In addition, free to attend events also take place in the capital and these have included, NFL on Regents Street, NFL Kickoff at Piccadilly and the Tail Gate at Wembley. 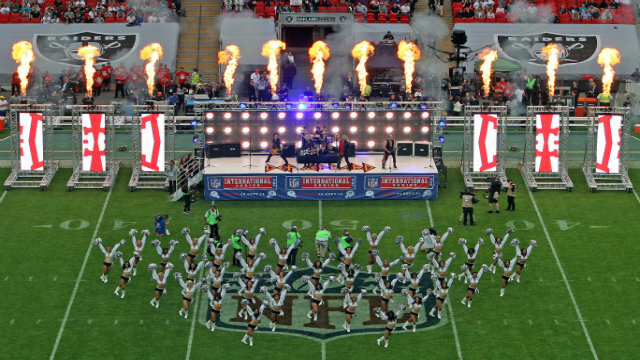 We worked with the National Football League (NFL) to bring its first international competitive game to London (2007). This included providing Mayoral endorsement, use of the Mayor's venues and marketing support. We targeted media and leisure campaign activity in New York and Miami including media promotion in NY with black taxis and a "London-hosted" game screening in Miami. We've also hosted the Jacksonville Jaguars home team picks during the live televised NFL Draft since 2015. We have supported the NFL with: ticket marketing and social media campaigns targeting UK, Germany and US audiences via Visit London channels, additional fan experience on Regent Street and Piccadilly Circus. We provided support on a detailed Economic Impact study and explored the feasibility of more permanent training and accommodation facilities in London (in conjunction with GLA).